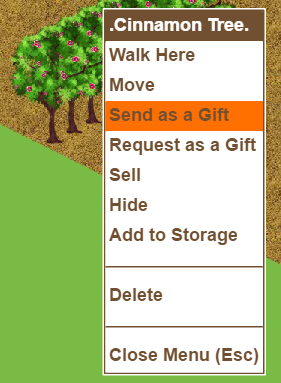 What is the "Send as a gift" option in the tree section? I've accidentally hidden a tree. How can I see it again? When I plant a tree from storage, why is it not ready to harvest? Why are some trees locked in the store? What facilities do the trees go in? What are the harvest times of the trees? Last edited by Tiger Laybourne; Sep 04 2018 at 11:23 AM. This option is not used to send the tree on which you clicked as a gift, but it refers you to the application that allows you to send a gift to your Facebook contacts directly by selecting the tree. You select your friend the normal way from the lists. This works for gifted flowers as well. Last edited by Tiger Laybourne; Aug 07 2016 at 11:24 AM. Accidentally I've hidden a tree. How can I see it again? The "Hide" essentially allows you to access on your farm which may be hidden behind a tree or building. When you click a tree (or building), "Hide" allows you to temporarily hide the item, allowing you to access what is behind the items. Just reload your farm and the item's you previously hidden will reappear. Note This option is only available on your farm. To hide the trees in your neighbours' or your employer's farm you must uncheck the option "Show Trees" under preferences via the wrench tool. Last edited by Telegraphs; Apr 02 2010 at 01:50 PM. Storing trees resets their growth. If you place a tree ready to be harvested into storage and then place it back on to the farm, it will need to regrow. With chop trees they will come out as already chopped and again, need to regrow. Last edited by Tiger Laybourne; Sep 04 2018 at 11:25 AM. Those you can buy, and which are locked until you reach the level required to buy them. Even if a tree is locked in the store because you do not have the required level to buy them, you can still receive a gift and plant on your farm. The two icons top right of the Tree section in the store allow you to filter the Trees in the Store to show specific types of trees. Or you can use the search box, type in the name of the tree you are looking for. Last edited by Tiger Laybourne; Sep 07 2018 at 02:45 PM. Chokecherry - unlocks at level 68 - Native american restauarnt. Papaya - unlocks at level 84 - indonesian restaurant, pet foods factory, thai restaurant, tropical shakes stand, vegetarian restaurant, vietnamese restaurant. Snake Plant Bush - unlocks at level 69 - interior design decor factory, plant nursery. Star - unlocks at level 66 - Fruit Stand, vietnamese restaurant. Last edited by marymarcel; Mar 23 2019 at 08:16 AM. Last edited by Tiger Laybourne; Aug 07 2016 at 06:52 AM. What are the harvest times for the trees? This is a list of the harvestable trees and their harvest or chop time. You can filter the Trees in the Store to show specific types of trees. Open the Store and click on the Trees tab. Top right you will see 2 icons. Last edited by Tiger Laybourne; Jan 27 2019 at 12:57 PM.